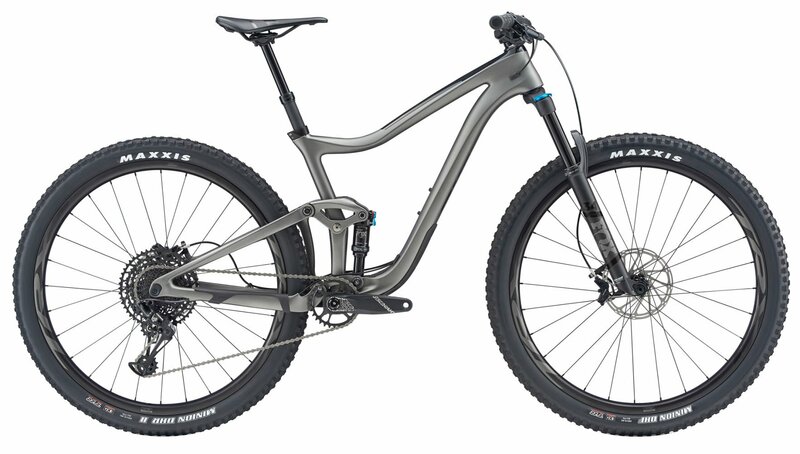 Amp up your trail riding adventures with this all new, all conquering 29er. Whether you’re gunning for faster enduro times or bagging a big backcountry loop, do it like a boss on this Big wheeled singletrack shredder. It took years for Giant’s team of engineers, product designers and pro riders to create a new mid-travel 29er that met their high standards, but the wait was worth it. The rebirth of this trail bike marks a huge step forward, offering a true advantage in all-round trail performance. It starts with a full composite frame that’s fitted with Giant’s most up-to-date Maestro suspension. The Advanced Forged composite rocker arm and trunnion-mount shock help produce 115mm of smooth rear-wheel travel that’s active and sensitive to small bumps, giving you killer traction and confident control. And the frame geometry is all new, with progressive headtube and seattube angles, shorter chainstays and a longer toptube—all engineered to balance the speed and control of its 29-inch wheels with the quickness and agility you need to rail corners, hammer through rock gardens and do it all with confidence and control. The Trance Advanced Pro 2 features SRAM’s efficient NX Eagle drivetrain that provides a huge 12-speed gear range that will allow you to spin your way up the climbs. The Fox Rhythm suspension fork keeps you in control by smoothing out the trail chatter and sucking up the bigger hits. A Giant wheelset wrapped in Maxxis rubber supply you with all the confidence needed to tackle demanding terrain with authority. When it comes time to slow things down, SRAM Guide T disc brakes will get you stopped on a dime in any condition. Topped off with a Giant cockpit and dropper post, the Trance will have you leaving your riding buddies in the dust. Fox Rhythm fork with 130mm of travel. SRAM NX Eagle drivetrain with a huge 12-speed gear range. 29” wheels for speed and control. Advanced grade composite frame with updated geometry.